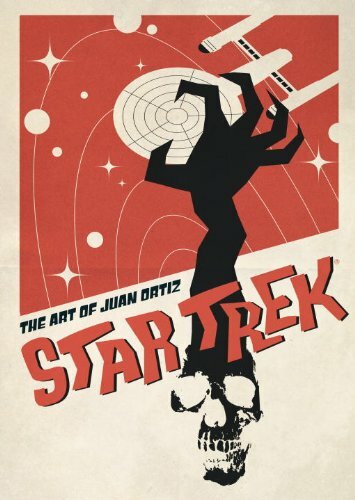 Fans of Star Trek: The Original Series would probably find this book rather nostalgic. This is a movie poster artbook created by Juan Ortiz for the TV series. Juan Ortiz started with a movie poster he created for one episode, liked it so much he created a whole bunch of them, one for each episode for the three seasons, including the unaired pilot 'The Cage'. There are 80 episodes in all. The art style is retro and looks great. The colours look like they are faded on purpose to create that old look from the 60s. For some posters, he even created the folded crumpled paper look, as if the poster had just been taken out from some box. In terms of design, you can see the influence from Juan Ortiz's background in editorial illustrations from the use of typography, composition, reverse colour fills. There are the strong shapes probably created by a vector graphics software. Compared to photographic movie posters, these Star Trek posters stand on their own for their composition and play of space (pun not intended). The last few pages contain the index with commentary. The index comes with list of titles with one memorable quote from each, and Juan Ortiz talking about his designs. This is a huge hardcover measuring almost 14 by 10 inches. The paper's low gloss. All the posters are nicely reproduced, printed to the edge. You'll be able to find the printed posters that sell separately online. But if you want the whole collection in one handy book, this is it. Recommended to Star Trek Original Series fans.